Well it finally happened. The other day I had a first that I knew would eventually happen, it was just a matter of time. While leaving an appointment a gentlemen in the elevator with us looked over at Kaleb and I watched the recognition in his face which followed with, “Oh, bless you guys.” Even though I knew something like this would eventually happen I was left unsure of how to respond. Part of the gentleman’s statement might have been geared towards the oxygen and monitor with Kaleb. Which depending on the extent of his knowledge could have even been part of what he meant, knowing that those with Trisomy 21 are more prone to health issues and are evident with Kaleb’s extra accessories. Which in reality the oxygen and monitor have more to do with his very premature birth having been born at 28 weeks then with Down syndrome. We don’t always go into the full birth story, NICU stay, and medical file which are all a part of Kaleb’s story with every person we meet. I really do not believe this guy meant anything negative by his statement. As we were talking we discovered a mutual friend with a daughter with Down syndrome. He began talking about her and it appeared to be an attempt to make sure we knew and understood that he was friends with her. However, I was aware that still he saw Kaleb’s diagnosis first. In the beginning after receiving the diagnosis, I struggled with this, so I get it. 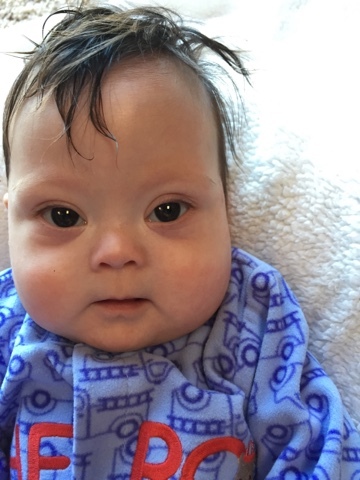 Even though many assured me that I would not always think or see his diagnosis first, and would tell me that often Down syndrome moves to the background as simply a condition that is just a part of him/her. Already at only six months of age, I am experiencing this and find myself thinking about it less and less. I also know others when they view Kaleb might first see Down syndrome. My hope and prayer is that they will not stop there, that they look beyond the diagnosis and see Kaleb. Later that same day while talking with big brother Kaden I got out my phone, pulled up an email, and showed him a picture that his teacher sent me of him playing at daycare. He thought it was cool that Mrs. Debbie, his teacher, had taken his picture and sent it to Momma. We looked at it and we pointed out his Kansas City Royals World Series Championship shirt, his Thomas watch, and how much fun he seemed to be having. He then proceeded to take his finger trying to move the picture around and said, “I want to see more.” He then told me about his friends and other toys in his room. He knew that there was more going on than what the picture could capture. The picture showed just one snapshot of what was going on. The picture didn’t include his friends who were playing nearby, it didn’t show more of the toys around, or the feelings he felt while playing. It is the same for many when they see someone who looks or acts differently. They see the initial picture, a picture that seems different. I have gotten to know Kaleb, I have fallen in love with the person. When I see Kaleb I see his beautiful eyes and his irresistible chubby cheeks. I see his spunky personality. A personality that shows itself more and more. I picture those big smiles I love and our "talks" we have as he coos at me. As with Kaden's picture I know that there is more to Kaleb than what meets the eye. That snapshot of his outward appearance or of his medical equipment doesn't tell the whole story. March 21st is World Down Syndrome Day, a day where we recognize those individuals who are born with a little something extra. It is a day to celebrate those individuals who so beautifully show us that every life can leave its mark and has something to offer this world. While having an extra chromosome gives them something in common, we recognize and celebrate their individual personalities, and varying talents/abilities. It gives us a day to show the world that there is more to the picture than what meets the eye.